The CR-500D/1000D Portable Wheelchair scale is an ideal scale for traveling doctors or nurses servicing disabled patients. The built-in wheels and handles make transporting this scale easy and comfortable. 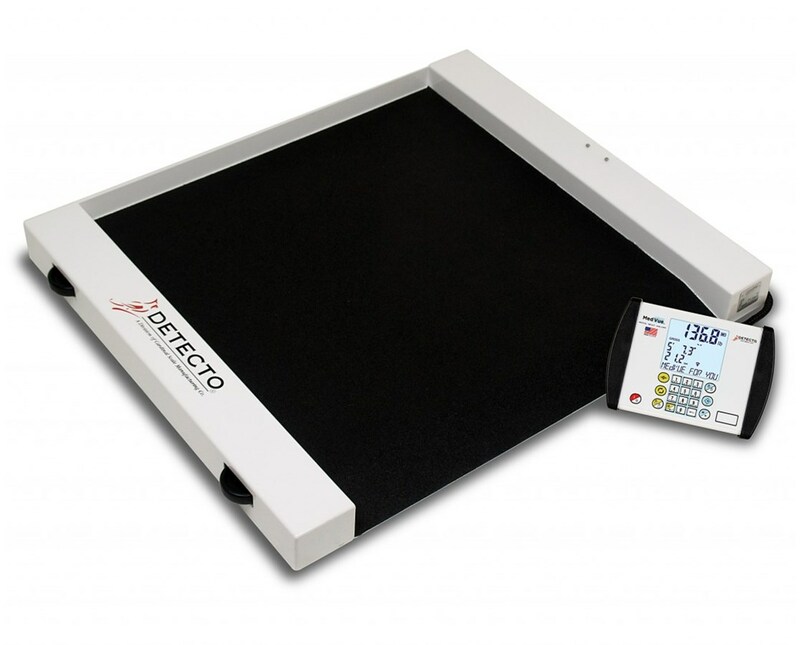 The remote LCD display is equipped with a 10 ft. cord to provide various options in the placement of the scale. 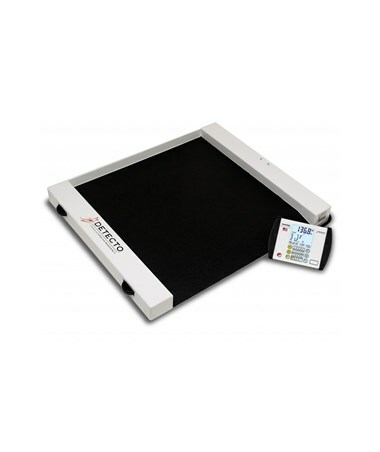 The spacious and non-skid platform provides stability and security for your patients. Some of the functions included with this scale are BMI, Dual Mode (lb./kg. ), Auto Off, and Tare. The scale can be powered an optional A/C adapter or 6 AA batteries (not included). The 1 year warranty has been included with this scale assures you that any difficulties you have with this scale will be quickly and efficiently resolved. The Portable Wheelchair scale now features the all new MedVue Medical Weight Analyzer display. The compact, lightweight analyzer mounts easily with a 350-degree swivel mounting bracket for optimal viewing. Its soft alphanumeric keyboard and simple navigation allow for data input and updates in four different languages - English, Spanish, French, German. MedVue® is versatile, with options for WiFi and/or wired or wireless Ethernet connectivity (sold separately), standard RS232 serial and USB ports. It can connect with various devices such as tablets, printers, PCs, networks, EMR/EHR systems, bar code scanners, and even cellular phones. The device may be connected using more than one of the ports simultaneously for efficiency. The weight analyzer features a large, adjustable, backlit LCD that displays weight, height, and BMI data at the same time. Patients may be assigned 14-digit IDs to save time. MedVue®'s high-capacity memory stores 200 transactions and 99 tare weights. The device boasts a built-in height rod port. It features made-in-the-USA quality and durability for long life and flawless operation. Please select your weight range preference from the drop down menu above. You may also view additional accessories for this scale by selecting the Related Products tab.